Eastern Sporting Union were crowned Champions of the inaugural edition of the Indian Women’s League at the Ambedkar Stadium in the Capital today (February 14, 2017), as the Bembem Devi coached side defeated Rising Student’s Club 3-0 to bag the coveted trophy. Strikes from Kamala Devi (32’, 66’) and Prameshwori Devi (57’) led Eastern Sporting Union to an easy win over their opponents, in a final, which was largely dominated – both in possession and chances created – by ESU. Although both Teams tried to score the early goal to take an advantage going through the match, Eastern Sporting Union pressed onwards in the opening minutes with almost every move. Kamala Devi tried to catch the opposition custodian off guard with a cheeky touch in the 3rd minute but lacking venom her shot was easily saved. Kamala Devi’s early attempt almost rattled Rising Student’s cage as they began to defend cautiously, committing bodies, whilst slowing down the tempo of the game. Attempts by Bembem Devi and Prameshwori Devi to foster goal-scoring chances were often nullified by the Rising Student defence. In the 24th minute, Prameshwori Devi’s cross almost ended in the back of the net, leaving the opposition custodian wrong-footed. However, the cross floated over the net as Rising Student survived another attack. It was a different scenario altogether in the 32nd minute as Eastern Union scored to take the lead when Kamala Devi tapped home her 10th goal of the Indian Women’s League campaign from a Prameshowri Devi cross from the right flank to give ESU a solitary goal advantage. With Kamala Devi and Prameshwori Devi pressing higher up the pitch to make things difficult for the Rising Student’s defence, Rising Student failed to foster any clear goal scoring opportunities in the first half as the half-time scoreline read 1-0. Eastern Sporting Union picked up where they left off and two minutes into the second half, Kamala Devi’s cross found Kashmina clear in the box, but the latter’s shot failed to find the net and went over the bar. Little did ESU had to wait for their second goal and in the 57th minute, Prameshwori Devi played a one-two with Kashmina and scored from a narrow angle to make the scoreline read 2-0. The second goal knocked the stuffing out of Rising Student’s Club and with low morale, they struggled to keep pace with Eastern Sporting Union. ESU however pressed to take an unassailable three-goal lead and put the tie to bed. And in the 66th minute Kamala Devi did just that. The fleet-footed forward burst in the opposition box and blasted the ball into the back of the net to make it 3-0. 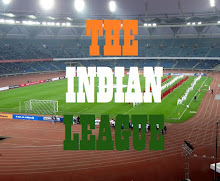 The Imphal based club could have added more gloss to the scoreline as chances came in plenty. However, with the result already secured it mattered little as the full-time scoreline read 3-0. 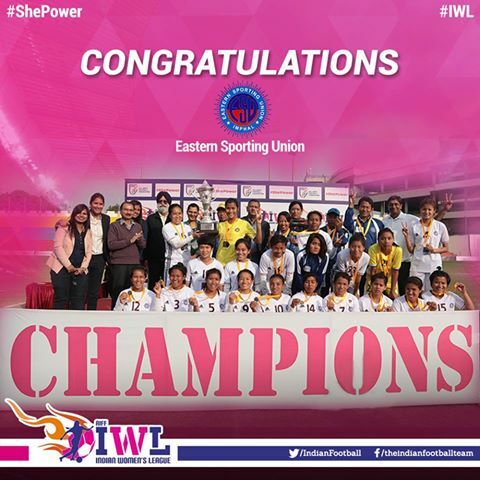 Eastern Sporting Union were awarded 10 lakhs for being Champions of Indian Women’s League while Rising Student’s Club were given 5lakhs for finishing runners-up. Jabamani Tudu bagged the ‘Emerging Player Award’ of Rs. 75000, Umapati Devi was awarded the ‘Most Valuable Player Award’ for Rs. 1.25lakh. For finishing top scorer with 11 goals, Kamala Devi was bagged a cheque Rs 1lakh.